Just Baked's Facebook cover image features a fan-submitted<br /> photo -- such as this image of a dog enjoying a Pupcake. In this new series, we’ll learn how real brick-and-mortar businesses are boosting their digital presence and ask social-media experts for their best suggestions. Southeast Michigan cupcakery Just Baked grew from one store in 2009 to a network of 17 with about 100 employees in just four years. While it had nearly 10,000 Facebook followers in 2012, the company felt that it could do more to increase its social engagement. Owner Pam Turkin asked her son, Josh Fishman, a millenial who recently graduated with a business degree, to serve as brand ambassador and handle social media. He began a series of new initiatives to boost interaction. 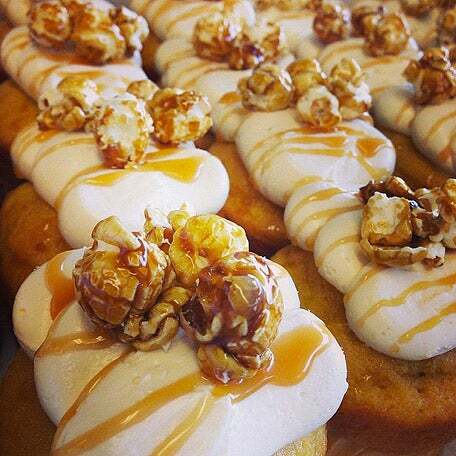 Fans who saw this image of Cracker Jack cupcakes on Facebook could ask for one by name and receive it for free at a Just Baked cupcakery. Giveaways for foot traffic. To increase engagement, Fishman created the Secret Flavor promotion, announcing new cupcakes such as Cracker Jack or Cherry Pie through its Facebook page. Readers who know the secret flavor can go into to a Just Baked location that day and receive that flavor free. The company uses Square as its point of sale and tracks these giveaways at its seven corporate locations. Fishman says consistent touting of such promotions helped spread the word about new flavors the company is informally testing. The tactics also helped the company reach 50,000 impressions a week by last February (a fivefold increase from the year before). Mari Smith, a Facebook marketing consultant, says such contests are essential for a brick-and-mortar business. “The number one rule is to get people in the door,” Smith says. The photos of dogs and children aren’t just cute, says Chicago social-media strategist Steve Knipschild. They also put the product front and center. And while the visuals are essential, so is what accompanies them, says Smith. Each photo post comes with a specific call to action, such as “Don’t forget Father’s Day,” along with phone numbers and email addresses. She says this approach makes it easy for anyone, especially if they are on a mobile device, to make a purchase in the moment. Tagging users when they are mentioned, as Fishman does, helps ensure they know their post was read and noticed. Flesh out the "About" info. New readers of the Just Baked Facebook fan page might not realize that the company has 17 locations, say Smith and Knipschild. While a map with its bakeries is available on its website JustBakedShop.com, this information could also live on Facebook. Businesses with several locations have a few options to add maps and multiple street addresses, including pasting the HTML code from their web site into an internal frame, using a third-party Facebook app from companies such as StaticHTML or GroSocial. Adding keywords to Just Baked's "about" section could help it come up in search, and adding company milestones can help tell the local bakery’s story, Smith says. Drive readers from Twitter to Facebook. Just Baked already uses its Facebook fans to help increase its number of Twitter followers, but Twitter could also beef up its Facebook engagement. Smith says links to special Facebook posts could be added to the company’s Twitter feed, driving users back to its page, giving extra promotion to special contests, videos and announcements. She says the company could also expand to new hashtags. Currently the company uses #JustBaked, but could use tags such as #fathersday or #cupcake to reach users who don’t already know the bakery.